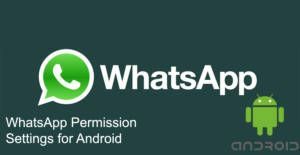 WhatsApp permission settings are very important for you to use applications with full features on Android devices. We are going to tell you about these settings for you on here and we will give some info about them. We also have a guideline for iPhone permission settings too. If you are using iOS device, you can check them. Let’s begin with tell you to how find these settings on your phone. Where is Permission Settings of WhatsApp on Android? Find WhatsApp from the list and tap on its icon. Now you reach the permissions of WhatsApp. This is one of the most important permissions of WhatsApp. If you enable this permission, you will see people’s name on WhatsApp and you will able to see all your phone contacts on the application. However if you disable this feature, you won’t able to see anyone’s name on the app and you won’t able to write them. Besides when people try to contact you, you will only see their phone numbers but not name. This can bring trouble to your at times. You can share your pictures which is located in your Gallery on WhatsApp. However you will need to enable this permission first, if you would like to do that. WhatsApp will able to access to your Gallery with this feature. If you disable it, you won’t able to share any picture or video from your gallery on WhatsApp but you can still take picture through using Camera via WhatsApp and you can share pictures with that. You can record your voice and send it to your friends through WhatsApp but you will need to allow WhatsApp to access your microphone first. If you don’t allow WhatsAPP to access to your microphone. You won’t able to record any audio on the application. You won’t also able to make calls or video calls. This is not very necessary feature if you don’t make video calls/calls/audio shares but still a fun feature to use. It is very important setting, if you are planning to make calls with your app. You can record videos through using WhatsApp features and send your friends immediately. If you allow access of WhatsApp to the camera, you can do it. You can also make video calls to people. However if you do not allow WhatsApp to access your camera, you won’t able to make video calls and record video with WhatsApp app. If there is a problem about detecting your camera on WhatsApp, you can read our guide about that on How to Chat Online. Notifications can be annoying at times but also they are needed much at times. You can make your notification settings for your current position at home, at work, at travel, etc.